Hi ! children, hope you are enjoying the panchatantra stories and learning some lesson from the stories. So, once again we are back to story-telling and today we will learn how to think and act smartly to overcome the difficult situations in life. Let's see yet another old and one of the most popular stories which is liked by the children the most. Yes, you got it, the story is about the timid little rabbit which acted smartly rather bravely to get rid of the tyranny from the big and ferocious lion. The story of the lion and the rabbit. Long long ago, there lived a ferocious lion in a dense forest which was a home for a number of animals. The lion used to hunt the other animals in the forest, kill them and eat their flesh for fulfilling his hunger. Children, do you know that a lion is a carnivorous animal which means an animal which eats the flesh of other animals. While animals like rabbit, elephant, horse etc which eat only plants and plant products are called herbivorous animals. Children, do you know what an animal like a bear eats and what are such animals called? Yes, animals like bear eat both plant / plant products and also other animals too. And these animals are called omnivorous animals. So, hunting other animals in the forest and eating their flesh has become the daily activity of the ferocious lion. And this activity of the lion made the other forest animals worried. As you know children, nobody wants to get hurt or killed by others. The forest animals too could not tolerate the tyranny of the lion. Children, do you know the meaning of tyranny? It is being cruel to others. And being cruel to others is not right. One fine day, all the worried animals in the forest had a meeting. One animal spoke, "Come on guys!, think smart and come up with a solution for our problem. One timid little animal said, "Lion is the King of the Jungle and we have to bow down to him." "Stupid", said the other. Because he is the King it doesn't mean that we should blindly obey him. We too have our own self-respect." "Stop arguing and come up with solutions." said an elderly animal. A wise animal spoke, "as we are destined to be killed by the lion one day or the other, let's be prepared to meet our fate. Let's have a bargain with the lion king. Instead of the lion hunting us, each day let's voluntarily offer ourselves as a food to lion by going to his den. Let the lion stay in his den. In this way, at least each day only one forest will be killed by the lion instead of mass killing. "What's your say, dear animals!" said the wise animal. The other animals thought the solution was good and agreed for the same. All the animals went to meet the lion king and present their plea. They presented their proposal to the lion king who thought for a while and found the bargain fair enough. So he agreed for the same. According to the proposal, each day one animal was taking the responsibility of getting into the lion's den to offer themselves as food for the lion king. Now the lion was too happy with this arrangement and was enjoying the delicious food without getting himself running, chasing and getting tired. One fine day, it was the turn of a small timid rabbit to go to the lion's den and offer himself to the lion. This little rabbit did not want to end his life and started thinking, "Oh! God, please help me to get rid of this cruel ferocious lion. Please provide me with a solution to come out for this problem permanently." The rabbit thought and thought and thought. Finally, "Idea!" shouted the little rabbit happily. According to his plan, the rabbit slowly made his way to the lion's den and he was unusually late in reaching the den. By the time, the lion was already moving impatiently with hunger. On seeing the little rabbit walking slowly, the lion became too angry and was about to pounce on his prey (the rabbit). At this crucial moment, the rabbit acted smartly and told the lion, "Hail! To the King of the Jungle. Today, I am late as I was stopped by another ferocious lion on my way to your den. And this lion seemed to be your rival. But, somehow I dared to tell him that I have to be on time as a food for our king, otherwise he would be angry. If, you kill me now and eat me, our king will surely have a fight with you." The rabbit continued saying, "O! King, the other lion seems to be an impostor who told me that there is no king here but if there is any king let him come to me and prove his power. Somehow, I could escape from him and came here to keep my promise." "Grrrr!" roared the lion with anger on listening to the words of the rabbit. The lion was too angry with hunger and on top of that he got a jolt on listening about his rival. 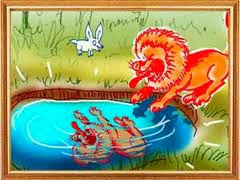 The ferocious hungry lion wanted to get rid of his rival and told the rabbit, "You little one!, where is the other lion? Come on. Take me to him at once, so that I will fight with him and kill him. The rabbit felt too happy as he thought that his plan was working out. The rabbit led the lion to a spot where there is a well. Reaching the spot, the rabbit said, "O! King, the other lion who wanted to kill me was in this well only." The lion peeped into the well and saw his own reflection in the well water. The ferocious lion which was very angry and hungry too, lost his thinking power and did not understand that he was seeing his own reflection in the water. The lion roared in anger which echoed in the entire forest and without thinking SPLASH! !, jumped the lion into the well. The lion's head dashed against the walls of the well and lo! he had to meet with his death in the well. Hurrah! jumped the brave and victorious little rabbit happily and ran to his friends to announce the happy and good news. Wasn't that great, children. A timid little rabbit who thought and acted smartly could solve a very big problem and win over the mighty ferocious lion. So, what moral did you learn from this story? Moral:Think and act smartly to come out of difficult situations in your life.